LA II (Angel Ortiz) was born in 1967 in the Lower East Side of New York, New York. Also known for the artistic names of LA II, LA2 or LA Rock which stands for “Little Angel” are often seen as tags in his artwork. 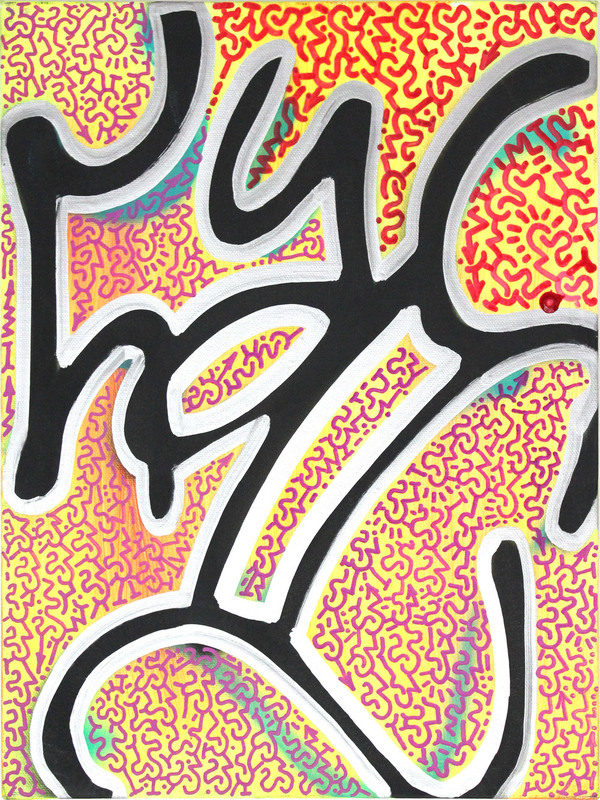 LA II began his career when he met Keith Haring in 1980 at the age of 13. Being one of the most recognizable Graffiti artists from the Lower East Side in the 1980’s Ortiz collaborated side by side with Keith Haring for a number of projects. Having dropped out of High School in Manhattan, New York in 1983, he traveled around the world working with Keith Haring until 1985. LA II is for Haring what Jean-Michel Basquiat was for Andy Warhol. Today LA II is considered an iconic graffiti artist, being unearthed from the massive power of Keith Haring’s body of work. LA II’s role role in Haring’s artistic development is clearly delineated by the unique and original look of their co-produced works. Fortunately, LA II is still alive, and his career is in its prime. LA II has a very collaborative nature. He seeks out to work with other artists giving characterization of his unique calligraphic patterns and lines to each piece. He has worked with dozens of artists in the art market today. Some of these names include Richard Hamilton, a number of street artists from the LES, Delta 2, Ero, and Cindy Shaoul. LA II's Urban Art style and graffiti heavily influenced Keith Haring’s work. If it is to be found the LA II, LA2 or LA Rock tag within a Haring artwork, then the piece was produced in collaboration effort between Keith Haring and LA II. LA II complimented Haring’s “empty space” drawings, Angel Ortiz helped fill out Haring’s drawings. Haring said, “All the work [Angel and I did] was about surface and usually covers or transforms the object it is applied to”. Haring and LA II combined their styles to create an overall surface of intermingling lines. They worked on Day-Glo painted plaster sculptures, real objects, or room-sized installations with graffiti writing that mixed with contemporary and ancient symbols that Keith loved so much. They worked on hundreds of works until Keith Haring’s death in 1990. LA II and Haring were constant creative partners for almost six years out of Haring’s decade-long career. Their collaboration produced hundreds of admired, sought-after and valuable pieces, which are exhibited in galleries worldwide, from New York to Tokyo to Europe. This partnership mirrored that of Braque and Picasso, except unlike LA II, Braque was given due recognition for his work. It is also to be noted that in Keith’s own writing, LA II was always mentioned as a part of Keith’s history. It would seem that critics, business people and even art historians have “overlooked”, or perhaps omitted, the crucial role of LA II in the history, development, and impact to Keith Haring’s body of work. The influence that LA II garnered over Keith Haring by meshing their creativity produced some of the most iconic works of art that exist in the art market today. Among some selected exhibitions on which LA II has participated are: Tony Shafrazi Gallery, New York City, with Keith Haring in 1982, in 1983 alongside with Keith Haring at the Fun Gallery, New York City, at the Galerie Watari, Tokyo, Japan, at the Robert Fraser Gallery, London, United Kingdom, at the Special Projects Paint Fiorucci, Milan, Italy, in 1990 Future Primeval Queens Museum, Flushing Meadows and Corona Park, New York with Keith Haring, Follin Gallery, New York City in 2001, Clayton Patterson Outlaw Museum, New York City in 2002, LA II & Keith Haring, Due amici a New York in 2003, Scope Art Fair, Los Angeles, California in 2004, and Galleria Leonardo Galerie, Bolzano, Italy in 2005. After his work with Haring ended, LA II continued to make his own artwork fighting to make his past and current work more well-known. In 2008 he was famously caught tagging his name in a restored Haring outdoor mural without permission and in 2011 he went to jail for one month due to graffiti around Manhattan. LA II lives in New York, New York and works to continue creating graffiti art.